Step 1: Place the oil, vinegar, mustard and sugar in a small screw-top jar. Season with salt and pepper. Shake well to combine. Step 3: Place the spinach in a large bowl. 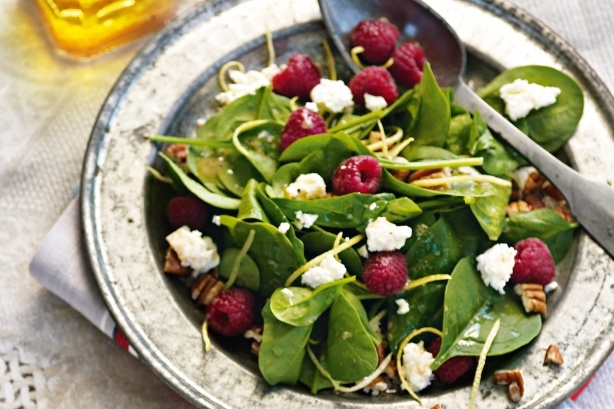 Sprinkle with the lemon rind, raspberries, pecans, and feta. Step 4: Drizzle the dressing over the salad. Toss gently to combine. Tips: Use a gluten-free mustard if you want this recipe to be gluten-free. Picnic Tip: To prevent this salad from going soggy, add the dressing just before serving.Store the spinach mixture, in an airtight container, and the dressing in the fridge until just before leaving. Keep chilled in an esky. Don’t forget to check out our other recipes for male fertility.